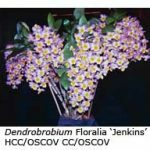 Whereas many dendrobiums are tropical orchids and require a heated glasshouse for satisfactory cultivation in Victoria, soft-cane dendrobiums can be grown and flowered outdoors or in a shade house, provided that they receive adequate light, especially during winter. 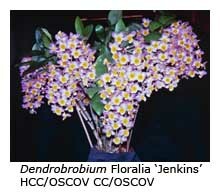 Nearly all soft-cane dendrobiums have the species Dendrobium nobile in their ancestry. This species (and also other species used in breeding soft-cane dendrobium hybrids) grow in the foothills of the Himalayas, where quite cool temperatures are often encountered during winter. The flowers are produced in spring in a range of colours ranging from white through yellow and pink to purple, often with a contrasting central colour. 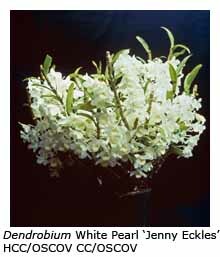 Well-grown plants carry 10-20 flowers, each measuring about 75 mm across. Soft-cane dendrobiums grow and flower best in relatively small plastic pots, seldom needing pots larger than 100-125 mm in diameter. Because flowering plants can grow quite tall, these pots topple easily unless a bottom layer of large river pebbles is used when re-potting. Pine bark (5-10 mm) is the most commonly used potting medium. There is no need to re-pot just because some roots begin to roam free but re-potting will become necessary when the plant grows over the edge of the pot so far that it becomes unstable. Soft-cane dendrobiums require more light than many other orchids. During the main growing season (November to April) the plants need 30-50% shade but for the remainder of the year they may be exposed to full sunshine. Like most orchids, soft-cane dendrobiums enjoy a light and airy situation and do best when suspended from the roof of the shade house. 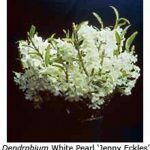 Best flowering results from maximum exposure to light during autumn and winter, when the current season’s canes mature and those pseudo-bulbs produced in the previous year shed their leaves. Some hybrids produce flowers on the most recently produced canes, whereas others flower only on canes that matured in the previous year. Regular and frequent watering is necessary during the period when the new growths are developing (November to April) but thereafter the frequency of watering must be reduced, especially during winter. Frequent watering in winter will result in the production of offset plants (keikis) instead of flowers from the leaf nodes. Similarly, the application of high-nitrogen liquid fertilisers during the growth period will promote the formation of keikis. Use a high-potassium liquid fertiliser such as Campbell’s A® (at half the manufacturer’s recommended strength) every week or two between November and April. For maximum flower production it is important not to fertilise at other times.